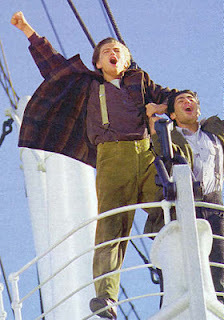 The 1709 Blog: Is Titanic 3-D a new work? An interesting article recently appeared in The New York Times. 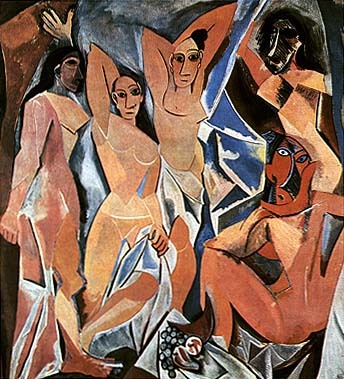 It concerns the use in both the 1997 Titanic film and its 2012 3-D version of a copy of Pablo Picasso's most celebrated 1907 painting Les Demoiselles d'Avignon. As is well known, the painting did not sink with the Titanic, but placidly hangs on the walls of the Museum of Modern Art (MoMA) in New York. Picasso died in 1973 and the rights (including image rights) in the huge artistic legacy the Málaga-born artist left behind are now administered by the Picasso Estate. 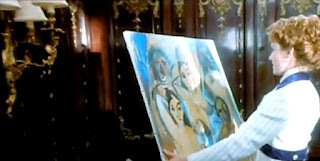 At the time when the original Titanic film was made, the estate refused to grant film-maker James Cameron permission to include any images of Les Demoiselles d'Avignon. However, Cameron used an image of the painting anyway and Titanic features a scene in which Rose-Kate Winslet looks at what is presumably a copy (?) of the painting. It was only after the Artists Rights Society complained that the film-maker agreed to pay a fee for the use of the image of Picasso’s 1907 work. Now that Cameron has released a 3-D version of Titanic, the Artist Rights Society has asked him to pay again for the use of the painting's image, asserting that the 3-D version of the film is a new work and, as such, is not covered by the previous agreement. “I don’t expect we’ll have any difficulty,” said Theodore Feder, president of the society, who contacted James Cameron a few days ago. Arguing that a 3-D version of a film released a few years earlier is a new work may have interesting consequences, which go far beyond requests for using the image of a painting. Copyright: king of the world? A “derivative work” is a work based upon one or more preexisting works, such as a translation, musical arrangement, dramatization, fictionalization, motion picture version, sound recording, art reproduction, abridgment, condensation, or any other form in which a work may be recast, transformed, or adapted. A work consisting of editorial revisions, annotations, elaborations, or other modifications,which, as a whole,represent an original work of authorship, is a “derivative work”. One may wonder whether the use of 3-D techniques is sufficient to a finding that "new" copyright subsists in the entire 3-D version of a film and be such as to trigger new requests for the use of images which featured in earlier 2-D version. Certainly, if this was the case, then would it be sufficient to release 3-D versions of films in which copyright is about to expire to extend the duration of protection almost indefinitely? In other words: is 3-D the new colourisation as far as copyright is concerned?